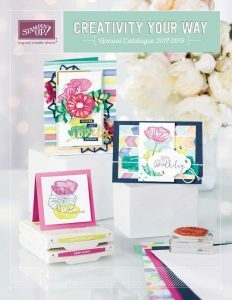 The new 2017-18 Annual Catalogue from Stampin’ Up! is now LIVE! I’ve been desperate to share this online with you ever since it was revealed to me back in Amsterdam at the beginning of April. So, if you haven’t already got your hands on a paper copy, grab a cuppa, sit in your favourite chair, click on the picture above and take time to drool over the new items. I hope you are as excited about the new products and gorgeous new In Colors as I was 8 weeks ago. I’d love to hear what your favourite new items are. With a BRAND NEW catalogue comes a BRAND NEW Promotion. Head to my Special Offers page to discover more. To order any items in the catalogue, go to my online store.